This evening one year ago, my wife called me outside to see the full moon and the ominous orange glow on the eastern horizon. It was my first glimpse of the Thomas Fire and we evacuated the following day. At the time I was working as interim executive director for the Green Coalition and my week was full of travels in and out of the valley, information sharing on social media and the many other fire related tasks that consumed us all. I had very little time to take photographs. A year later I have begun to remedy that and I’m glad to share these photos from before and after the fire from around the valley that show its impact and recovery. 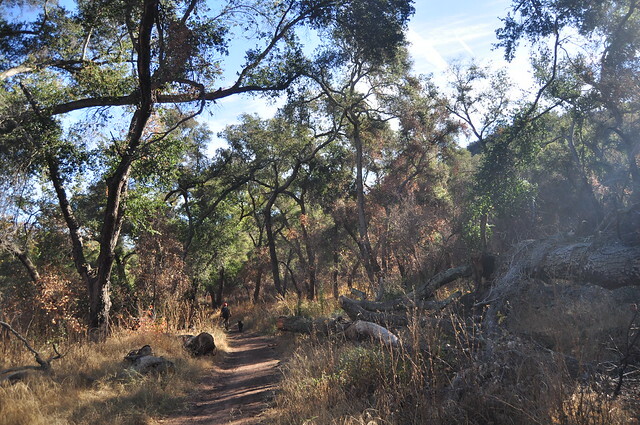 The trail up to Kennedy Ridge through the Ventura River Preserve has been one of my favorite hikes since moving to the valley six years ago. 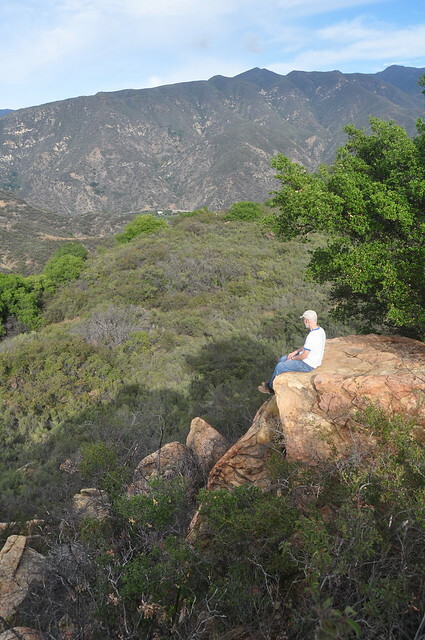 In 2014 I this photo of my father looking north and east from the rocks by the first mile marker bench just after the spot where the trail first crests the ridge. It shows the beautiful oak tree (on the right edge of the photo) that nestled among the boulders and shaded the overlook. It was an especially welcome rest spot on hot days. Here is the same view with a landscape crop showing some of the oaks in Kennedy Canyon just north of the ridge. I returned with a friend to this spot for the first time last week and the oak tree that was nestled in the overlook is charred and fallen. While a few sumac and other plants in the chaparral below the overlook are recovering, the difference in the plateau below the overlook is dramatic. 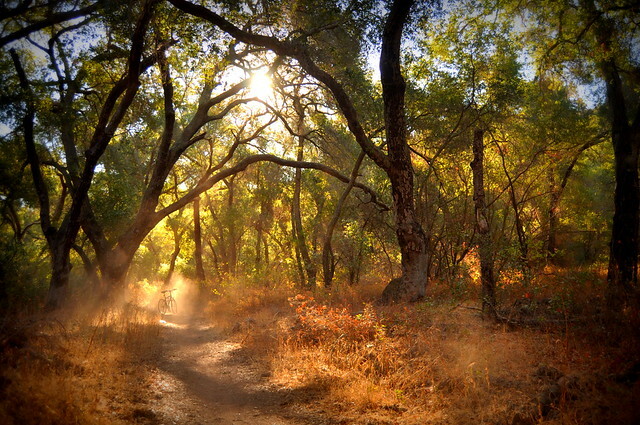 Early on a September morning in 2013, I biked up Wills Canyon and captured one of my favorite photos from around the Ojai Valley. The canopy of oaks branches intertwine with each other to greet the rising sun. When I returned to this spot Thanksgiving weekend, the changes were so dramatic it was hard to find the right spot from which to take the photo. 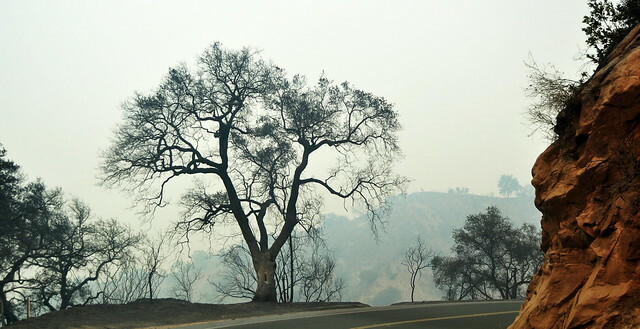 I realized that the two most prominent trees in the foreground of the photo had been taken by the fire. I had to use the trees in the background of the original photo to orient myself. My final before and after photos shows one example of the remarkable resilience I have seen in oaks all over the valley. Many of these magnificent trees were reduced to blackened silhouettes by the fire. I captured one of these oaks along the 150 coming down Dennison grade on Wednesday, December 6, 2017, less than 48 hours after the fire started. OVGC board present Severo Lara and I were driving around the valley checking in on the impact of the fire and acrid smoke which was everywhere. When I returned to visit this oak a year later, its trunk was still blackened, but half its crown was a vibrant green and I could see other oaks around it recovering as well. May we all continue to find resilience and recovery in the coming year. Oh, have you seen the video of Judy Dench extolling the virtues of how trees communicate? Availabe via FaveBook..tyou can kplook it up Your photos capture that marvelous phenomenon……They must appreciate you too! 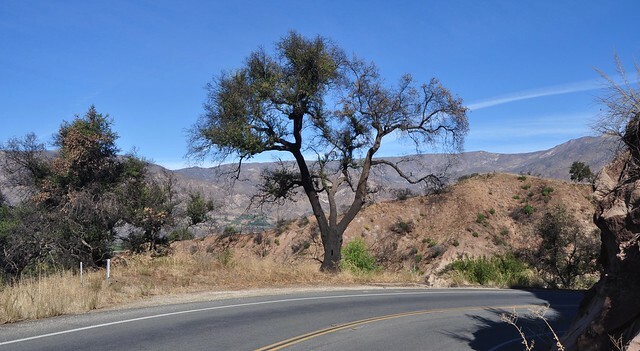 Oh, when I lived in the Ojai I was an active citizen to preserve it! Does that group still exist or have the members merged with yours? So beautiful ! 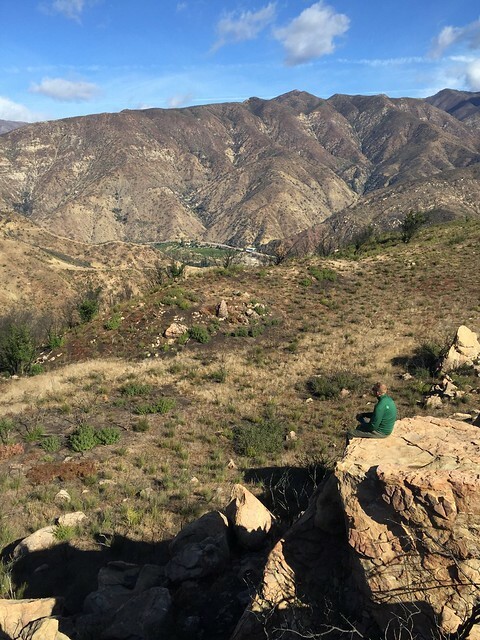 As a former Ojai resident I carry memories and am motivated and dedicated to preserving the last remaining open space still somewhat natural Montebello Hills…a fire did damage our hills and inspired this pertinent Haiku….